No, you should wait for "Extended module"
Also, it'd be useful if gravestones were smeltable. I have really stupid villagers who keep drowning, no matter how safe I try to make their village. Can you please add config option that will allow player to disable gravestones with zero items from player? 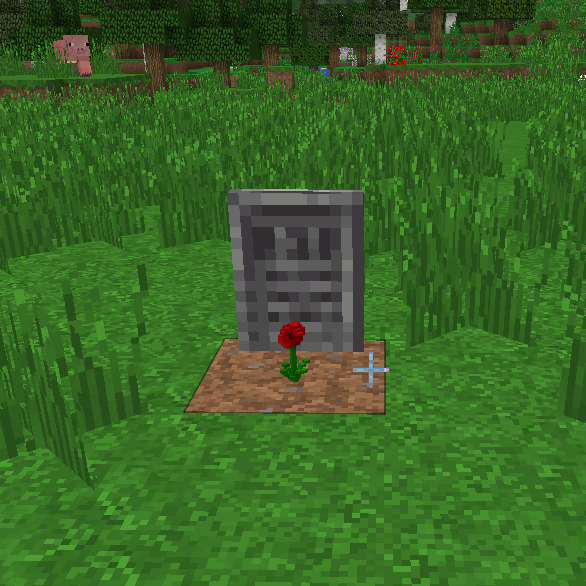 Here is what i mean, if player has 1 or more items in the inventory, gravestone will appear after his death, if not - no gravestone. Ok. It will be added. Does anyone know the "correct" way to explore the catacombs?? I mean in the catacombs the floor is made by night stone, and the night stone will give player paralysis and curse effect . I don't know what curse do but paralysis will make player move really slow and unable to jump, with that effect, explore catacombs is basically impossible. So, is there any way to explore the catacombs without getting the paralysis effect?? Don't tell me turn off the night stone is the only option. Hello. The problem you were described looks incredibly weird. There are nothing in this mod which give paralysis effect. "Curse" do nothing at the moment(I'm still working on it - it will create special type of mob at cursed player death). It may be some kind of compatibility problem, some another mods features, or bug(but it looks like no one have the same problem). Unfortunately I'm far away from home in a business trip, so can't test it now, or help you in any another way. I found out the paralysis effect was from LycanitesMobs, it seems the night stone will give player effect from other mod. I feel like the obelisk texture should be lower res to fit in better, but that's just me. is a 1.12 version expected soon? Does anyone know how to revive dead villagers? Zombies attacked a village I've been living in for a while, leaving only one survivor. I happened to pick up two villager corpses, though. Can I bring them back to life? Any info is greatly appreciated! You need to create an altar for it. Its crafting recipe almost the same as for enchanted table, but you should use bone blocks instead of obsidian, skeleton skulls instead of diamonds and diamond/nether_star(it based on your configs) instead of book. Hi I have a problem. I'm playing in infinity evolved 1.7.10 + gravestone + chocolate quest. We set the griefing gamerule to false. Any idea where it could come from ? We enabled the mob griefing just to see if this was what was causing the isue. It appears it wasn't. first WE LOVE THIS MOD ON OUR SERVER Im not sure if this is the Issue. But have do you know if your mod is compatible with RTG? Once I installed and created a new world RTG would not generate.